Although we have still been enjoying the beautiful summer-like weather the distinct chill of fall is in the air. 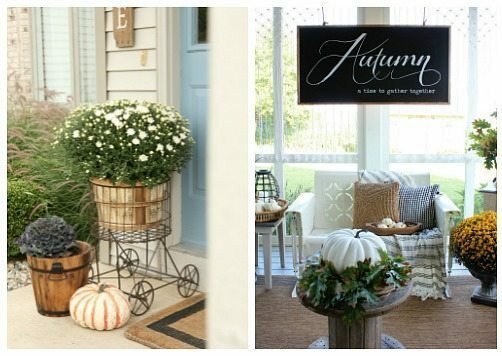 And today we are embracing the beautiful fall season while we join, Taryn Whiteaker, along with 12 of our friends to share how we like to bring a little touch of fall to our front porches. Sadly, this little front porch of ours sat bare and unused for many years. I’ve always loved the idea of having a big veranda or wrap-around porch – a place to sit outside and watch the world go by. I envision a space filled with wicker furniture or a quaint porch swing, along with window baskets and flower pots overflowing with colorful blooms and neighbors waving and smiling in greeting at one another. It all sounds pretty cozy, right? Well, that was the feeling I was hoping to convey when I finally set aside some time to dedicate to our front porch. And even though this little space isn’t big or grand, I knew I could still make it a place we would enjoy spending our time. I’ve had my sights set on these rattan chairs for years now and knew our front porch would be the perfect place for them. Their slightly weathered look add to the casual feel I was hoping to create. I also added a few of my favorite pillows because even though we are outside we still want to be comfy and cozy! We’ve had these neutral buffalo check pillows for a while now and they are still two of my favorite. And this fall I added this gorgeous navy pillow to my collection. It’s made from a vintage Chinese wedding blanket and it’s absolutely stunning (it’s from one of my favorite Etsy shops). A throw is perfect for those chilly mornings when the air starts off crisp and cool. I wanted to add just a subtle touch of the season and bring in a few pieces that remind me of fall. I picked up two of these hay bales and stacked them on either side of our chairs, they are perfect for giving a bit of height to these beautiful white mums. Another fall favorite of mine. I think they look so cute in these apple baskets I found, don’t you? As we move further into the fall season I’ll make a few additions, like adding heaps of pumpkins. I simply can’t wait to get my hands on some but I’ve had a hard time finding any this early. And even though I was hesitant at first about how much we would actually use this space, we really do spend a lot of time out here. After Nick heads off to work, our little one and I usually start our morning out here. Juice for her and coffee for me. 😉 She loves to just sit… listening to the birds’ chirp, picking a few hydrangeas or waving as our neighbors pass by. It really is the cozy little space I envisioned. Now be sure to enjoy these beautiful tours below and I hope you find some inspiration for your own front porch this fall! Gorgeous. I love the baskets of flowers, so pretty and your chairs look so inviting. You guys! This is beautifully fall. I love all the small touches you added to make it feel autumnal. Cute kid too! It looks beautiful Alicia and the perfect place to sit on a fall day. Love the blue in there too! Love your front porch. Very cozy and inviting. Your early fall porch looks so pretty and so you! Love the soft colors and those mums are gorg! I would be sitting out here all the time. Such a beautiful and cozy space and I LOVE love love that pillow! Thank you, Jamie. Isn’t it such a beautiful pillow, everything Cloth and Main makes is gorgeous! What a gorgeous space! I absolutely love the white mums with the pops of blue! SO pretty! The hay bales and apple baskets are absolutely perfect! I wish we had a porch with enough space for a lovely little sitting area like that; it’s so pretty, Alicia!! Thank you, Krista! I truly can’t believe we didn’t use this space until this year! Love those chairs and your beautiful porch! Do you mind sharing where you found the table between the chairs?